Patents are usually dry, dull affairs, but this latest Apple patent has an elegant beauty to it that is more than a little bit breathtaking. Yes, it’s for a solar-powered iPhone, but Apple being Apple, they’ve got a better solution to solar-charging than just a bunch of ugly panels stuck to the back of the device: the energy collection cells are actually hidden underneath the display. The iPhone itself would look no different, but lay it out in the sun and it will juice itself up. 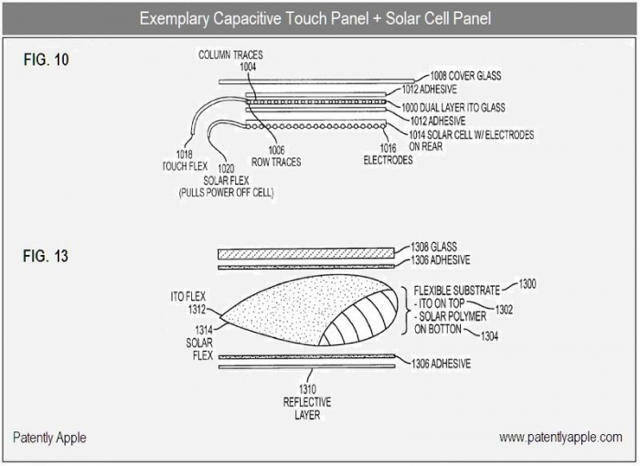 As Patently Apple notes, Cupertino might already be moving forward with this: the recent to switch the iPhone’s backside substrate to a non-metal surface opens the door for double-sided solar panels behind the display. I’d love to see this roll-out: the ability to juice up a dead iPhone for just one more call by laying it out to sop out the sun would be a welcome option. My only problem with this — and, in fact, all solar-powered phones — is my own conditioning: electronic manufacturers have been telling us for years not to keep our gadgets in harsh direct sunlight, and now, they suddenly want us to.